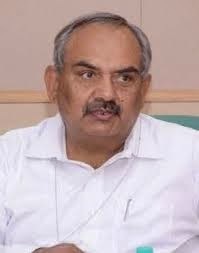 Vasundhara Raje-government appointed Rajiv Mehrishi as the chief secretary of the state and Subhash Chandra Garg as the principal secretary, finance in December 2013 after formation of New government in Rajasthan. The 1978-batch IAS officer would replace the current incumbent C S Rajan who was holding the additional charge after C K Mathew was transferred as chairman of the transport department. The new chief secretary is an alumnus of St. Stephen's College, Delhi, Mehrishi completed an MA in history before getting into IAS. Later, he went to UK and did an MBA course from the University of Strathclyde, Glasgow. In IAS, he began his career as a Sub-Divisional Officer (SDO) in Ajmer and then joined as additional collector in Jodhpur. In 1984-85, he became the collector of Bikaner. In 1988, he joined the secretariat of the President of India as a deputy secretary. He also served as a director in the petroleum ministry and joint secretary in the cabinet secretariat.